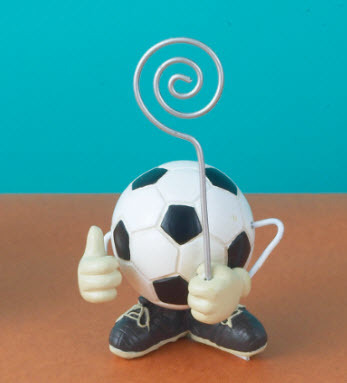 Looking for soccer themed birthday party favors or need soccer ball place card holders for an event? We know that your guests will fall in love with these! And they can do double duty - first as a card holder and then guests will take them home to hold a favorite photo! Well made with a solid weight and feel, these handed-painted holders measure approximately 3 1/2" tall x 1 1/2" wide.